“Mid-infrared” refers to wavelengths between 3-20 micrometers. This range is also referred to as thermal radiation because things that are at room temperature emit the most light in these wavelengths. By looking at this wavelength range we can see objects in space that are at this temperature, about 300 degrees above absolute zero. These are, for example, planets that resemble the Earth, so not those hot Jupiter-like planets (that we have known for thirty years or so), but planets that may have an earth-like atmosphere and perhaps, yes… maybe even have a form of life. There is good hope that we’ll find an Earth-like planet in orbit around our closest star: Alpha Centauri. It is so bright that we have to be very careful when we observe it with METIS, otherwise our sensitive camera will be damaged. And that is exactly the challenge: block as much light as possible from the bright star until we can find the small planet nearby. That is certainly the most spectacular use of METIS, but it is also the most risky one. Fortunately, there are many other things we can study with METIS. In our galaxy, the Milky Way, we will also make observations of the disks around young stars and the atmospheres of old stars. And in certain other galaxies we can also make observations in the mid-infrared light. In almost every galaxy there is a super-massive black hole in the center. And when that actively accretes matter, the surrounding swirl of gas and dust gets hot and at certain places it reaches room temperature so that we can easily see it in the middle infrared. “ELT” stands for “European Extremely Large Telescope” and that is the name of the largest telescope in the world that is now under construction. It is being built by a European organisation (the European Southern Observatory or ESO) on a mountain in the Atacama desert in Chile and will be ready in the mid 2020s. With its diameter of almost 40m, the area of that telescope will be larger than the areas of all current large telescopes combined! There is no company in the world that can produce such a large mirror and so the main mirror (the one that will be almost 40m in size) consists of 798 segments, each with a diameter of about 1.45m. And they all have to be placed in such a way that the whole mirror then becomes a parabola. Almost impossible, right? Finally, “Imager and Spectrograph” refers to what the instrument will be able to do: record pictures and spectra. With the “Imager” we can for example take a real picture of an earth-like planet and with the “Spectrograph” we can analyze the light of that planet and compare it with models of atmospheres to discover what happens on that planet. METIS is de “Mid-Infrared ELT Imager and Spectrograph” en we zullen deze ingewikkelde naam even uitleggen. “Mid-infrared” betekent een bereik van golflengten (3-20 micrometer) die we ook thermische straling noemen omdat spullen die op kamertemperatuur zijn het meeste licht in deze golflengten uitstralen. Dus kunnen we op deze manier ook in de ruimte voorwerpen zien die op deze temperatuur, zo’n 300 graden boven het absolute nulpunt, zijn. Dat zijn bijvoorbeeld planeten die op de aarde lijken, dus niet die hete Jupiter-achtige planeten (die we nu al sinds dertig jaar of zo kennen), maar planeten die mogelijk een aard-achtige atmosfeer hebben en misschien, ja… misschien zelfs een vorm van leven kunnen hebben. Er is goed hoop dat we een aard-achtige planeet in orbit rondom onze nabijste ster zullen vinden: Alpha Centauri. Die is zo helder dat we erg voorzichtig moeten zijn als we die met METIS zullen waarnemen, want anders raakt onze gevoelige camera beschadigd. En dat is dan ook precies de uitdaging: zo veel mogelijk licht van de heldere ster blokkeren totdat we de kleine planeet in zijn buurt kunnen vinden. Dat is zeker de spectaculairste bedoeling van METIS, maar ook de riskantste. Gelukkig zijn er nog heel wat andere dingen die we met METIS kunnen bestuderen. In ons sterrenstelsel, de Melkweg, zullen we ook waarnemingen doen van de schijven rondom jonge sterren en de atmosferen van oude sterren. En ook in bepaalde andere sterrenstelsels kunnen we in het midden-infrarode licht waarnemingen doen. In bijna ieder sterrenstelsel zit er namelijk een super-massaal zwart gat in het midden. En als dat actief materie aanzuigt, wordt die heet en komt op bepaalde plekken juist op kamertemperatuur zodat we ze dan makkelijk kunnen zien in het midden infrarood. “ELT” staat voor “European Extremely Large Telescope” en dat is de naam van de nu in aanbouw zijnde grootste telescoop der wereld. Die wordt door een Europese organisatie (de European Southern Observatory of ESO) op een berg in de Atacama woestijn in Chili gebouwd en zal in 2024 klaar zijn. Met z’n doorsnee van bijna 40m wordt de oppervlakte van die telescoop groter dan de oppervlakten van alle huidige grote telescopen gecombineerd! Er is geen bedrijf in de wereld dat een zo grote spiegel kan produceren en dus bestaat de hoofdspiegel (degene die bijna 40m groot zal zijn) uit 798 segmenten, ieder met z’n 1,45m doorsnee. En die moeten allemaal precies zo geplaatst worden dat de hele spiegel dan een parabola wordt. Bijna onmogelijk, toch? “Imager and Spectrograph” betekent wat we met de camera (METIS) zullen doen: plaatjes en spectra opnemen. Met de “Imager” kunnen we bijvoorbeeld een echt plaatje van een aardachtige planeet opnemen en met de “Spectrograph” kunnen we het licht van die planeet dan analyseren en vergelijken met modellen van atmosferen om te ontdekken wat er op die planeet gebeurt. When a former Max Planck colleague who now works at the Stifterverband, a public-private think-tank, called me in October and asked if I wanted to take part in a workshop about open science, I was unsure what astronomy could offer in this regard. However, when simply writing up the tools and processes many astronomers use (and take for granted), it quickly becomes clear that astronomy is very much an open science already. In the spirit of open science, I would like to document here my preparation for the discussion section of the workshop tomorrow. What does openness in astronomy mean? Open data: access to raw data (e.g. through the ESO archive) as well as access to surveys (e.g. through VizieR) and meta-data (e.g. through Simbad). The access is available for everyone and in most cases either in near real-time or after a proprietary period of maximum 12 months (in most cases). Open source: access to scripts, libraries, programming tools, codes, … that are used to analyse the raw data and derive scientific results. In the most open projects (such as astropy), even the development process is open and anyone can contribute via e.g. github. Platforms such the Astrophysics Source Code Library, on the other hand, publish the final code itself and make it searchable through standard literature search engines. Open access means free and unimpeded access to consolidated scientific results as published in peer-reviewed journals. While many relevant astronomical journals, including the just recently launched Nature Astronomy, are not open access by themselves, most (all relevant?) journals now allow publishing the author’s copy on preprint servers such as on the arXiv. Most current research articles can be found on “astro-ph” (the astrophysics’ section of the arXiv). Still troublesome, however, are technical articles (e.g. about telescope or instrumentation projects), that are published in the SPIE proceedings. A google search for the fulltext of the article, including “filetype:pdf” as a further filter, often reveals the author’s copy, however. 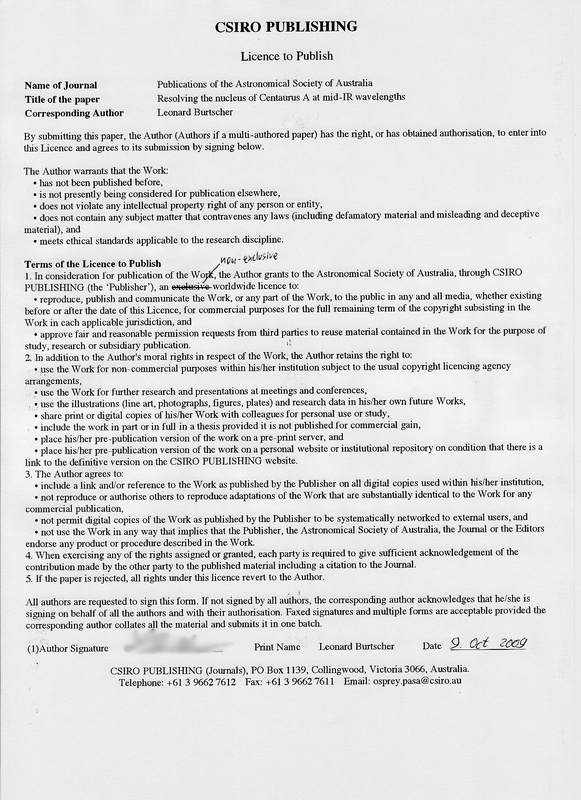 In some cases, authors can “rebel” against the copyright notice they typically have to sign in order to publish an article (see example below for one of the articles published during my Ph.D.). 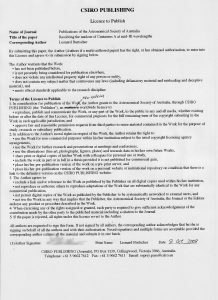 Example of a modified copyright agreement granting only a non-exclusive license to the publisher and thus allowing to publish my own article on my homepage or on preprint servers. Apart from open data, open source and open access, open science can also encompass outreach and communicating with the public. This can be in more traditional “teaching” ways through blogs (e.g. the German SciLogs platform on which I have blogged about my trips to Chile during my Ph.D. and later), talks, open house days etc., but in some cases it can also mean directly embedding citizens in your research project, such as demonstrated successfully by the GalaxyZoo project that involves citizens to classify galaxy morphologies, a task in which humans have so far been better than machines. Open science should can also include transparent selection procedures. After all, the particular selection of proposals, job candidates, laureates etc. can shape the de-facto view of a field for a long time and therefore comes with big influence and power. This could, for example, mean to publish the criteria which will be used to select a candidate for a job and to democratically nominate committees that decide about proposals and prizes. This is partly the case in astronomy, e.g. the committees that help select proposals for the Deutsche Forschungsgemeinschaft are elected by the scientific staff themselves. Last, but not least, I believe open science should also include democratic structures in universities and research institutes. Usually, in German universities, there are “Fachschaften” that have a say on the selection of professors, and the Max Planck society sponsors one of the largest Ph.D. networks in the country, the Max Planck PhDnet. On the more senior, but not yet tenured, level, however, the situation is less good. Attempts to form a postdoc network within the Max Planck Society have not been greeted with sympathy in several institutes as some directors fear to lose influence if juniors also have a say. This is, however, not specific to astronomy, but rather a general symptom of the research and higher education landscape in Germany. Why do we promote open-ness in astronomy? Astronomy is a highly competitive field (typically only one out of 20 astronomy Ph.D.s eventually gets a tenured research position). Open-ness in astronomy would not be supported if it weren’t also promoting competitiveness and productivity. Regarding data, observatories, that run big telescopes, promote open science in order to increase the observers’ desire to quickly publish “their” data (lest others “steal” them). Top-nodge data are often publicly available from the start. The first observations with the next, biggest space telescope will be open access from day 1, as announced today. The first observations for instruments built for the European Southern Observatory ESO, are also usually publicly available from the start, e.g. these GRAVITY science verification data. Other data are usually openly accessible after a 12 month “proprietary period”. This can sometimes be in conflict with the “owners” (PIs) of the data. Regarding open source, the motivation to publish tools and software code is manifold: the author(s) of the code publish it in order to promote their code (and collect citations to associated research papers), but also so that others can contribute in the development. Last but not least, publication is the best way to help others in finding bugs and errors and therefore make your own research more credible. Open access is in the interest of everyone except scrupulous publishers who want to make a profit from publicly financed research. It helps to promote science and the scientific method, also in the wider society, if the basic results are openly accessible. And it helps researchers from poorer countries who cannot afford paying expensive subscription fees to Nature, Science et al. Public outreach also helps everyone, but can be a burden for researchers who also have to teach / supervise students, manage projects, deal with bureaucracy and publish, publish, publish. Motivations to nevertheless indulge in public outreach reach from simple PR for your own research (in order to attract more research money or to boost one’s ego…), but can also include serious collaboration with the public (see GalaxyZoo). Often the motivation for being active in public outreach is also to promote the scientific method (e.g. the Science March initiatives) or a feeling of a moral obligation as publicly funded research should also be of benefit for the public. Transparent selection procedures and democratic structures, finally, are also a win-win situation: researchers gain trust in the process and will therefore try harder to win prizes, fellowships and jobs. The academic institutions, on the other hand, win by becoming more attractive to a wider range of (international) applicants. The only downside is an increased effort of documentation / communication, but I believe the benefits well outweigh the costs. I am interested to see the discussion tomorrow and will try to report back with a view from the other participants / fields as well! I realised that the fantastic literature database we use every day in astronomy is not something that should be taken for granted. Many other fields do not have their “ADS”, but platforms like Science Open are trying to change that. Hallo, ik ben Leo en kom origineel uit Oostenrijk maar heb lange tijd in Duitsland gewoont. Vier maanden geleden ben ik met mijn gezin, mijn vrouw en onze drie kinderen, naar Leiden verhuisd. Ik werk aan de Sterrwacht van de Universiteit Leiden en wil jullie vandaag graag wat vertellen over de sterren en ons..
Overdag, wanneer het helder is, zijn we bezig met ons werk, overleggen met collega’s, praten met vrienden en gezinsleden. We kunnen dan snel vergeten dat er nog veel meer om ons heen is! Indien de nacht helder was, zullen we vandaag de maan kunnen zien. Hij heeft een afstand van rond 380.000 km — tien keer de hele wereld rond! En toch is deze afstand klein in vergelijking met andere astronomische objecten. Dus gebruiken astronomen niet kilometers om de afstand te beschrijven maar de snelheid van licht. En die is heel snel! Het heeft maar rond één seconde nodig om van de maan naar ons te komen. Dus is het makkelijk om ook verdere afstanden te beschrijven. Bijvoorbeeld: onze zon is ongeveer acht licht minuten ver en de (kleine)planeet Pluto slechts vijf en half uur. [Kennen jullie die?] De andere planeten zijn niet zo ver en er zijn er acht in totaal: Mercurius, Venus, de aarde (onze wereld), Mars, Jupiter, Saturnus, Uranus en Neptunus. En er is nog veel meer: We wonen maar op één planeet van miljarden in ons sterrenstelsel, de Melkweg! Er zijn rond 200 miljard sterren in de Melkweg (die we bij heldere hemel en indien het heel donker is, kunnen zien) en elke ster kan enkele planeten hebben! Tot vandaag zijn er rond 3700 planeten buiten ons zonnestelsel bekend, maar we weten al dat er nog veel meer planeten moeten zijn omdat we tegenwoordig alleen de grootste en bizarste planeten kunnen waarnemen! In Leiden bouwen wij dus een camera voor de volgende, grootste telescoop van de wereld, de European Extremely Large Telescope. Hun spiegel is groter dan alle spiegels van de huidige telescopen samen! En met de camera die we bouwen (die heet METIS) kunnen we dan voor de eerste keer planeten die op de aarde lijken bestuderen en misschien een andere planeet vinden waar leven mogelijk is. Maar tot dit moment is de aarde de enige planeet in het zonnestelsel en ook in de hele Melkweg, die we kennen en waar leven mogelijk is. Dus moeten we haar goed beschermen! One of the long-standing questions in astrophysical research is what exactly triggers the onset of Active Galactic Nuclei (AGNs). The aim of this project is (1) to study the nuclear star formation history in a well selected sample of nearby AGNs with exquisite data (VLT/X-SHOOTER spectra) and (2) to participate or lead pioneering efforts to study gas, dust and star formation in the parsec-scale environment of nearby actively accreting super-massive black holes using the upcoming infrared interferometer MATISSE on the VLTI. Wieso brauchen wir den Science March auch in Deutschland? Gestern Abend war ich (als einer der Organisatoren des Münchner Science March) im Gespräch mit einem Reporter für Bayern 5 Aktuell. Er sagte mir, dass er nur einen kurzen Bericht machen wolle und daher nur Platz für eine Frage/Antwort habe: “Wieso brauchen wir den Science March auch in Deutschland? Was er damit meinte: Dominieren etwa in Deutschland schon “fake news”? Gibt es hier Schließungen von Universitäten und werden Wissenschaftler etwa auch hierzulande gegängelt wie in Ungarn oder der Türkei? Erhalten staatliche Agenturen Maulkörbe und verbreitet sogar die Regierung “alternative facts” wie in den USA? Zum Glück lassen sich all diese Fragen mit einem klaren Nein beantworten. Mitte der 1990er Jahre hat die rot-grüne Regierung unter Gerhard Schröder den “Binnenkonsens” im Sozialgesetzbuch verankert. Demnach müssen Medikamente nicht mehr generell nach wissenschaftlichen Standards getestet werden, sondern lediglich nach den Standards, die in der jeweiligen “Therapie-Richtung” üblich sind. Das heißt im Klartext: wer ein neues (medizinisches) Medikament zulassen will, muss in aufwändigen klinischen Studien die Wirksamkeit des Medikaments nachweisen. Wer aber neue homöopathische Globuli, Bachblüten-Extrakte oder ähnliche Quacksalberei auf den Markt bringen möchte, darf sich auf seine “besondere Therapierichtung” berufen und muss lediglich nachweisen, dass das Medikament ungiftig ist. Dafür gibt es keinen vernünftigen Grund, aber insbesondere die Grünen wollten damals diverse esoterische Praktiken in den Katalog der Krankenkassen bekommen, was dann auch so geschehen ist. Bis heute zahlen viele große deutsche Krankenkassen für Mittelchen, für die nie ein Wirknachweis erbracht worden ist. nach mehreren Anläufen und Rückschlägen hat die CSU dieses Jahr die Einführung einer “Infrastrukturabgabe” (vulgo “Ausländer-Maut”) durchgesetzt. Sie hat zwar explizit auch zum Ziel, ausländische PKW-Halter zur Kasse zu bitten, begründet diesen “Racheakt” aber dann doch damit, dass zusätzliche Investitionen in die Verkehrsinfrastruktur notwendig seien. Nun sind sich die meisten Experten aber einig, dass durch diese Maut viel weniger Geld in die Bundeskasse fließt als von der CSU gedacht, womöglich wird sie gar ein Zuschuss-Geschäft. Damit fällt der wesentliche Nutzen dieser Maut weg. Das, freilich, wusste man schon seit langem, hat es aber ignoriert. ganz am rechten Rand des politischen Spektrums versucht die AfD auch mit der Leugnung wissenschaftlicher Erkenntnisse Stimmen zu fangen und schreibt in ihrem Parteiprogramm zum Thema Klimawandel, dass sich das Klima immer schon geändert habe, der Einfluss des Menschen nicht gesichert sei und mehr CO_2 im übrigen gut sei für das Wachstum von Pflanzen. Die Entwicklungen in der Türkei, in Ungarn, in Polen und in den Vereinigten Staaten haben auch gezeigt, wie schnell der Abbau von Demokratie und der damit verbundene Abbau freier Wissenschaft gehen kann. Es ist daher wichtig, immer wieder daran zu erinnern, wie wichtig freie Wissenschaft für unsere Demokratie und für unseren Wohlstand ist. Vor der Bundestagswahl im September sollten wir ganz konkret dazu aufrufen, die zur Wahl stehenden Parteien kritisch bezüglich ihrer Unterstützung von Wissenschaft zu beurteilen. und letztens sehe ich den Science March auch als Appell an Wissenschaftler, mehr zu tun, um die Bedeutung ihrer Wissenschaft einer breiteren Bevölkerungs-Schicht zugänglich zu machen. Wichtig ist dabei meines Erachtens nicht nur das Vermitteln von Ergebnissen, sondern auch die Diskussion der wissenschaftlichen Methode. Wir müssen stärker aufzeigen, wie rigoros Ergebnisse hinterfragt und geprüft werden und dadurch klar machen, weshalb wissenschaftliche Ergebnisse so viel belastbarer sind als Meinungen und Gefühle.